The Nihon Maru is an extremely heavy ship. It is, in fact, the largest ship used for naval warfare. Looking very much like a vast floating fortress, it has a massive superstructure with an impressive three-storey keep as a centrepiece. It is a physical manifestation of the Shogun’s power, and its presence is enough to raise the morale of nearby friendly ships and keep them fighting. It carries a large number of soldiers for boarding actions, but its sheer size and extravagant design makes it a slow and cumbersome vessel. 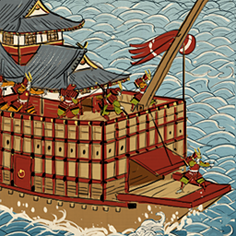 Historically, the Nihon Maru was a huge, three-decker flagship, built for the daimyo Toyotomi Hideyoshi in 1591. It was a lavish masterpiece that symbolised Hideyoshi’s wealth, power and ambition and it was decorated with Shinto designs and a brocade curtain. Although built to impress visitors, it did see action during the Korean War of 1592 when the Koreans attacked the harbour of Angolp’o. The Nihon Maru had just returned from battle and was an irresistible target for the Koreans’ fire arrows. Fortunately, the ship’s three-fold curtain functioned as an arrow catcher, and a team of carpenters kept the ship seaworthy by quickly repairing damage caused by Korean cannons, ensuring the Nihon Maru survived the onslaught. Very large crew, in particular melee troops.